Experience the thrill of rock climbing at the DISC! A great team-building activity for families, co-workers, and school groups. Certified belayers may climb during open climbing hours. All rock climbing classes are scheduled by appointment (429-3472) and held at the DISC (1295 W. Wood). All participants must wear tennis shoes. Certified belayers may climb during facility hours. All rock climbing classes are scheduled by appointment. Are your kids climbing the walls? Then Little Rockers is just what you’re looking for! Emphasis is on gross motor development, coordination, and balance. Harnesses are provided for all climbers. This class is designed for new climbers. 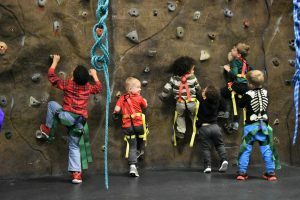 Children learn climbing basics while strengthening agility, balance, and coordination. Sessions are led by certified recreation specialists. Introduce your child to this fun new sporting option! When: Wednesdays, October 3 – 24, 6:30 – 7:15 p.m.